This is a true story about an 18 year old girl's experience in a mental hospital for two years after being diagnosed with Borderline Personality Disorder. It's a short memoir about her thoughts/ feelings and the people she learns to become friends with. When I ordered this book online, I didn't realise how short it was, meaning I was able to whiz through it in one sitting. This was really great because I was able to immerse myself in the late 1960s and learn about what life was like for the mentally ill in this time. It was a lot different to today and I learned a lot from this book just about treatment and hospitalisation. The characters brought the story alive I felt. There were so many different people with different mental illnesses so it was really fascinating to hear about their stories as well as the main protagonist's. I liked how they became close friends and explored together which was nice to read, since the topic can be quite morbid and low, yet there are some entertaining parts include. Something unusual about this novel that I didn't expect were the snippets of Kaysen's mental records from McLean Hospital. There were some notes about her experiences written by doctors and psychiatrists and records from when she was admitted to her release. I enjoyed reading these and felt that they were a nice touch to the memoir. Overall I did enjoy reading this however it was very short and (since I watched the film first) I expected a lot more than I received. The film is actually set out quite differently whilst the book seems to jump around a bit more. Nevertheless I did enjoy this and felt like I learned a lot about mental health. Was insanity just a matter of dropping the act? Before reading this memoir, I actually watched the film, which I really enjoyed. It had a great cast and a really strong message. 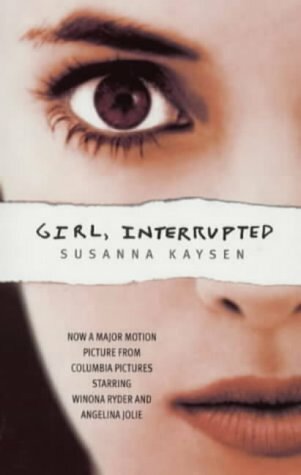 I was surprised at how different the book was to the film and visa versa, however I still felt that it was an accurate reflection of Kaysen's life.